We're growing in the Tri-Cities with new locations in Coquitlam and Port Moody! We're growing in the Tri-Cities! On July 1, we launched a new vehicle in Port Moody and a new neighbourhood in Coquitlam, adding a few more Modos to our growing fleet in the Tri-Cities. 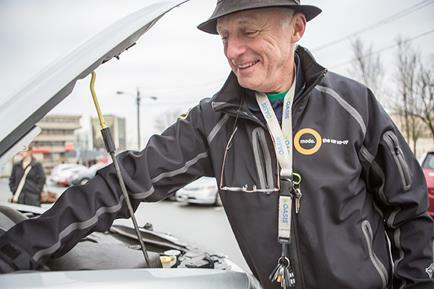 Since placing our first Coquitlam car two years ago, we've been working to increase our presence and give our Tri-Cities members more options when it comes to transportation. Recently, our Director of Marketing, Selena McLachlan, talked with the Tri-City News about our expansion efforts in the area and the future of carsharing lying with people making "smart, pragmatic decisions." Check out the Modo Moves below for details on these new cars, as well as car news in your neighbourhood! Watch our webseries, Let's Go! NEW LOCATION: At the Broughton Street Parkade – under the Victoria Central Library, between Douglas and Blanshard – you'll find a 2015 silver Kia Rondo (#687). ADDED CAR: Element/Sovereign now has a 2015 white Mazda 3 Sport (#594) alongside its Fiat 500. UPGRADE: We've placed a 2015 grey Kia Soul (#706) at SFU Verdant to replace the 2009 Suzuki SX4. NEW LOCATION: Coquitlam City Hall is a 2015 blue Kia Soul (#694) in a designated stall on the south side of Guildford Way, between Town Centre Boulevard and Pinetree Way. Our stall is east of the RCMP building, just west of City Hall. NEW LOCATION: Kensington Plaza is a 2015 white Kia Rondo (#689) in a designated stall on the south side of Glen Drive, between The High Street and Pinetree Way. Our stall is just east of Kensington Plaza. CAR CHANGE: At Ash & Fourth Avenue, a 2015 silver Kia Rondo (#699) has replaced the 2013 Toyota RAV4. NEW LOCATION: Klahanie is in front of 713 Klahanie Drive, north of Nootka Way and south of Murray Street. 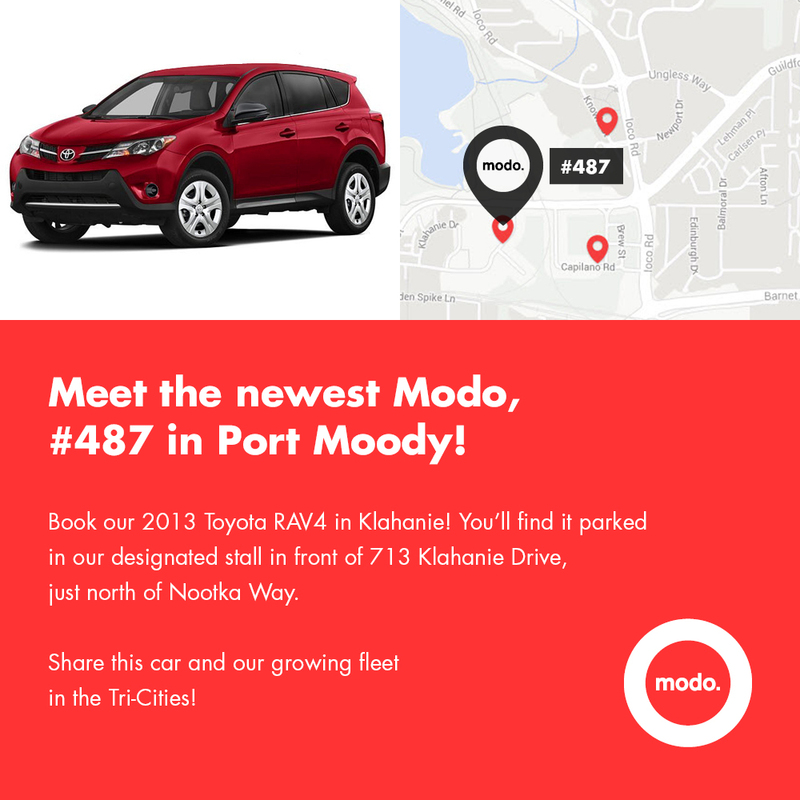 Our 2013 red Toyota RAV4 (#487) is in a designated stall on the east side of the street, just north of Nootka. NEW LOCATION: River Rock–Bridgeport is between the River Rock casino and parkade, on the south side of River Road, just east of Charles Street. You'll find a 2015 white Kia Sedona (#690) in our designated on-street stall. FLOATERS: During the FIFA Women's World Cup, while the Stadium SkyTrain lot is closed, our Ford Ranger and Mazda 2 are living at VCC Downtown. FLOATER: At Main Street SkyTrain, a 2015 orange Toyota Prius C (#705) has temporarily joined the Orlando until its permanent home is ready. UPGRADE: A 2015 green Kia Soul (#698) has replaced the 2006 Toyota Corolla at St. Catherines & E 29th. The Corolla was our oldest car, proudly carrying Modo members since 2007 and was our last car with a 2006 model year. CAR CHANGE: At Maple Community Garden, there's now a 2015 silver Kia Rondo (#691) instead of a red one. CAR CHANGE: You'll find a 2015 white Kia Rondo at Eburne Park instead of a 2015 Mazda 3. UPGRADE: At Harbourview, there's now a 2015 yellow Kia Soul (#676) instead of a 2011 Mazda 2. When it comes to your canine and feline companions, Modo is happy to have them along for the ride. However, we have a strict fur-free policy and require that they must travel within a carrier. Members who stray from our policies can incur hefty fines, so to avoid that, read our latest Tip from Modo's "Fur Prevention Officer", Alissa! Her Top Tip of the Month? How to accommodate furry friends safely, without infuriating other members. It's not as salacious as it sounds! Actually, we repair 3 to 5 tire punctures weekly caused by nails and screws picked up along the road. If you notice a soft tire, report it to the Member Loyalty Team as soon as possible. With a phone call, you can help us avoid long-term damage to Modo tires. >> COMMUNITY Since 1997, Modo has been investing in our communities and we rely on our members to help continue this support. >> #LETSMODO How do you get hundreds of magazines (and a few comedians) to The Cultch? Ask the team at Poetry Is Dead. >> MODO VS. OWNING Do you own a car, or are considering buying one? Why own a car when you can share 400? >> BICYCLE VALET Good news – The Bicycle Valet is open on Granville Island all summer free of charge! 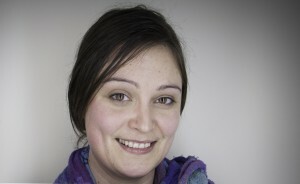 >> MODO TIPS You've read Alissa's fur-free tips, now check out the Pro Tip archive on our blog! 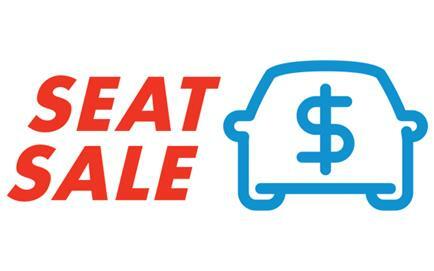 In case you missed the news, we'll be featuring a few vehicles across our Modo neighbourhoods so members can enjoy a little price break and maybe try a new car or two along the way. Be the first to book and watch for future sales in our monthly eNews! Check out our new webseries with Vitamin Daily that features local business, entrepreneurs and Vancouver personalities using Modo to explore the hidden gems of our city. In Episode 1, our host, Ken, teams up with the gang at Bestie – Chinatown's finest currywurst restaurant – to pick up produce from a front-garden farm near Main Street and some secret spices in Little India. After helping Bestie gather ingredients, Ken joins up with some friends from Bao Bei Brasserie to find the best dumplings in the city. Who'll win the Great Dumpling Debate? The Kitsilano Market has returned to its regular location! VFM would like to thank everyone for their support during a difficult transition.